As an eye-catching focal point, urns create additional visual interest whether planted or unplanted, or raised on a pedestal. This exceptional urn is an excellent example of our unique design and manufacturing capabilities. This urn is shown on an optional pedestal. This urn measures 42.2" in diameter with a 24" square base X 52.8"H. The optional pedestal measures 25.2"W at the top, 27.2" W at the bottom and is 32.3"H. This urn is maintenance free, tough, light weight, completely frost proof and non-corrosive. The urn is composed of a fiberglass composite and is a serious long term alternative to terracotta and lead (and even some other metals). Ideal for use inside and out for flowering plants or even small flowering trees. 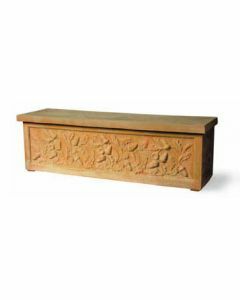 Urn comes in the terracotta finish as shown. Other finishes are available, please contact us for details. Click on image for greater detail.